The people and businesses honored Saturday night at the Greater Tehachapi Chamber of Commerce's Installation & Recognition Gala are certainly busy people — as evidenced by their many volunteer contributions enumerated for those gathered — and they're on a mission to make Tehachapi a stronger community. Greater Tehachapi Chamber of Commerce Chairperson and Tehachapi News Business Manager Stephanie Garcia, center, and Chair-Elect Jim Miller present the 2019 Citizen of the Year award to Linda Carhart. 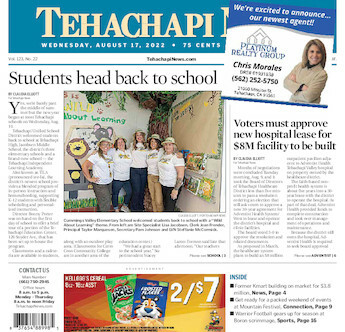 The recognition is jointly bestowed by the chamber and Tehachapi News. Leaders of Terra-Gen Operating Co., recipient of the 2019 Large Business of the Year award, are surrounded by those who presented them with recognition Saturday night. Jeremiah Soto, accepting the honor of 2019 Large Business of the Year, speaks on behalf of Terra-Gen Operating Co.
Kern County Second District Supervisor Zack Scrivner, right, presents Terra-Gen's Jeremiah Soto with a certificate of recognition in honor of the company's selection as 2019 Large Business of the Year. The 2019 Large Business of the Year honors went to Terra-Gen Operating Co. The large east Kern employer has demonstrated a strong commitment to the Tehachapi community through many donations and sponsorships. Sharing in the honors to Terra-Gen are Randall Tyson, Jessie Nevarez, Raudel Castanon and Jeremiah Soto. The award was jointly presented by the Greater Tehachapi Chamber of Commerce and Tehachapi News. Marty Pay, holding several certificates, and his Marty Pay Farmers Insurance, was honored as the 2019 Small Business of the Year by the Greater Tehachapi Chamber of Commerce and Tehachapi News. Pay is surrounded by staff members and those who honored him Saturday night. The 2019 Small Business of the Year award went to Marty Pay and his Marty Pay Farmers Insurance. 2019 Citizen of the Year Linda Carhart is surrounded by everyone who presented awards and recognition to her Saturday night. With her husband and fellow volunteer James Carhart by her side, 2019 Citizen of the Year Linda Carhart speaks at Saturday night's dinner. Kern County 2nd District Supervisor Zack Scrivner presents a certificate of recognition to 2019 Citizen of the Year Linda Carhart. A certificate of recognition given to Linda Carhart by Perry Finzel on behalf of Rep. Kevin McCarthy, R-Bakersfield. Tehachapi Mayor Susan Wiggins, right, presents a certificate of recognition to 2019 Citizen of the Year Linda Carhart. A certificate of recognition was given to Linda Carhart, left, by Mia Cifuentes on behalf of Sen. Shannon Grove, R-Bakersfield. Assemblyman Vince Fong, R-Bakersfield, presents a certificate of recognition to 2019 Citizen of the Year Linda Carhart. Master of Ceremonies Pete Sturn introduces 2019 Citizen of the Year Linda Carhart. Chamber President Ida Perkins, left, recognizes Sandra Honea as Chamber Ambassador of the Year 2018. Chamber Chairperson of the Board Stephanie Garcia, left, presents an award to outgoing Director Sally Periman-Lawrence in thanks for her service. Chamber Chairperson of the Board Stephanie Garcia presents an award for “outstanding service to the chamber” to outgoing Director Carl Gehricke. Greater Tehachapi Chamber of Commerce President Ida Perkins, left, accepting a thank you gift for her continued chamber service as presented by Chairperson of the Board Stephanie Garcia. Assemblyman Vince Fong, R-Bakersfield, swears in 2019 Chairperson of the Board Stephanie Garcia. The Greater Tehachapi Chamber of Commerce 2019 Board of Directors are sworn into office. They are, from left to right, Director Liz Trejo, Director Kellie Dudevoir, Chair-Elect Jim Miller, Director Susan Abrego, Chairperson of the Board Stephanie Garcia, Treasurer Carolyn Wiles and Director Jessica Davidson. Assemblyman Vince Fong, R-Bakersfield, swears in the Greater Tehachapi Chamber of Commerce 2019 Board of Directors. They are, from left to right, Director Liz Trejo, Director Kellie Dudevoir, Chair-Elect Jim Miller, Director Susan Abrego, Chairperson of the Board Stephanie Garcia, Treasurer Carolyn Wiles and Director Jessica Davidson. Assemblyman Vince Fong, R-Bakersfield, (not pictured) swore in the Greater Tehachapi Chamber of Commerce 2019 Board of Directors, including Chair-Elect Jim Miller, Chairperson of the Board Stephanie Garcia, center, and Treasurer Carolyn Wiles, right. Tehachapi City Councilman Michael Davies delivers the evening's invocation. Tehachapi City Manager Greg Garrett and Greater Tehachapi Chamber of Commerce President Ida Perkins at Saturday's Greater Tehachapi Chamber of Commerce Installation & Recognition Gala. at the Chambers social hour prior to the evenings program. Tehachapi Citizen of the Year Linda Carhart, second from left, during the Greater Tehachapi Chamber of Commerce's social hour before Saturday evening's awards.